East of the Sun - West of the Moon is a uniquely beautiful 4BR / 3.5 BA home that is tastefully decorated and comfortable. 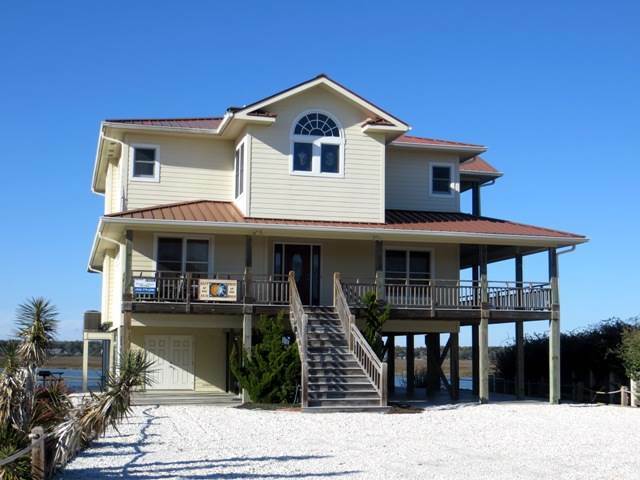 It offers expansive views of the bay, dunes and ocean - every room has a water view! The reverse floor plan has wrap around verandas on both levels - for moon and star gazing. The updated kitchen provides all the necessary equipment for easy meal preparation. There are two full entertainment systems, 2 flat screen HDTVs, surround sound in the family room, and wireless internet. This incredible property allows you to enjoy the bay and the ocean with equal ease - beach access is directly across the street. NEW in 2018 - a dock has been added for fishing enthusiasts. This property has loyal guests who return year after year, so do not hesitate to take advantage of an open week! Sleeps 10: K, Q, Q. 2Q, and a trundle in family room. All beds are made for your arrival and bath linens are provided for 10 occupants.